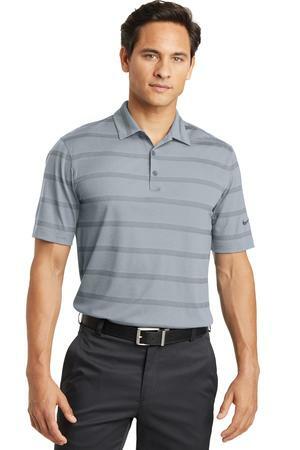 The Nike Golf Dri-FIT Fade Stripe Polo Style 677786 is available in sizes Adult Sizes: XS-4XL and may be purchased in your choice of the following colors: Dark Steel Grey/ Anthracite, Photo Blue/ College Navy, Sport Teal/ Anthracite. Subtle horizontal stripes combine with Dri-FIT moisture management technology in this polo that keeps you dry on and off the course. Design details include a self-fabric collar three-button placket and open hem sleeves.